Paddle boards typically fall into two categories: inflatable and solid. 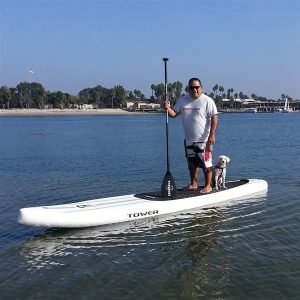 Inflatable Standup paddle boards (iSUPs) are cheaper and often more convenient to transport. Beginners benefit from the improved buoyancy and stability which make the learning curve that bit simpler. Our reviews intend to give you the best information from personal experience but naturally our opinions may differ from yours. This is our guide to the best inflatable paddle boards in our opinion from hours of testing and practical usage. All of these iSUPs have been tested by our team and the beginners we have taught in our classes and SUP excursions. 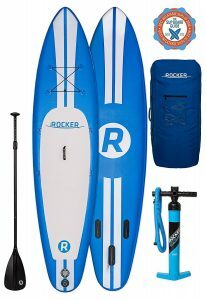 The majority of beginner and intermediate paddle boarders will buy inflatable paddle boards, mainly for the convenience; they are super easy to transport and store. iSUP technology has advanced over the last few years to make them highly rigid and stable. If you have never been on a top inflatable paddle board, you will actually be very surprised and think it is a solid board. Only choose a solid (fiberglass) SUP if you have lots of storage space at home; a roof rack for transportation and go paddle boarding more than twice per week. Yes, the technology has improved greatly over the last 2 years. Are inflatable paddle boards durable? Yes, we have iSUPs that are 4 years old and been is use almost daily. Mainly PVC and made durable with the dropstich technology. The fin is the the element under the SUP that helps maneuverability. These are detachable on iSUPs. The PSI stands for ‘pounds per square inch’ and related to the amount you need to blow up your iSUP. Can children use inflatable paddle boards? Yes, they are stable enough to help kids balance just fine. See our sizing information. You can get cheap, made-in-china iSUPs under $300, but you get what you pay for! Good brands spend thousanads on R&D. How do you store inflatable paddle boards? Most iSUPs come are sold in packages which include a carry bag. These are then stored in a garage or cupboard. Can inflatable paddle boards pop? Yes, if stabbed with a knife for example,but unlikely in open water even if you hit rocks. How do you clean an inflatable paddle board? Hose down with fresh water and soap. Some people also add a little UV protective spray after. What Size iSUP Do I need? Long paddle boards are made for speed, while smaller boards are best for touring as they give you better agility in the water. The most popular all-round iSUP size is 10-11 feet. 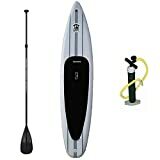 Most of the inflatable paddleboards reviewed below are available on Amazon.com and eligible for FREE SHIPPING in the USA, even if you are not an Amazon Prime member. If you live outside the States, please check the delivery costs before purchase. 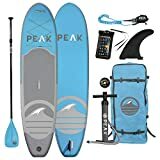 Some boards are available interest free for 6 months using Amazon’s Store card. With a tag proclaiming a two-year warranty we had high hopes for this board, the first on test. 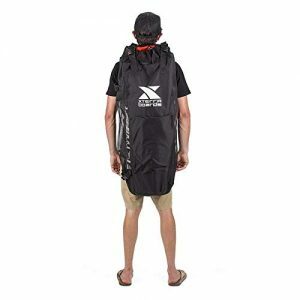 The package includes a dual-action pump, adjustable aluminum paddle, repair kit and backpack. The fin layout is two fixed and one removable nine-inch travel fin. The aluminum paddle has an ergonomic design with obvious quality and can extend from 63” to 85”. Its three pieces are sealed to prevent it taking in water. The pump is another excellent piece of kit, ergonomic handles, pre-greased mechanism, gauge facing up and around 150 strokes needed to pressurize the SUP. So, out of the box we inflated it in five minutes and as usual the first few were easy but trying to fully inflate it took a bit more effort. The color scheme is light gray and dark gray and is a bit underwhelming compared to its Technicolor competitors; however, the subdued palette is quite stylish and will suit a more classic taste. The iRocker is a foot longer and two inches higher than mosts iSUPs and we did feel the benefit of this in the water. We liked the width of this board, feeling it to be a good compromise of speed and stability. So does the iRocker beat other brands hands down? Not quite, there are a few issues with the package and they are all related to the backpack. It isn’t finished to the quality we are used to and it already looked like it was starting to fray around the edges where it would take the most hammering. Single stitching isn’t strong enough either for the weight of the SUP. Internally there are compartments for all the peripherals but they are exactly the right size meaning that you have to be careful to make sure you are packing everything correctly as there is no room for error. We would also like to have seen some kind of grommet in the pack to allow for drainage. Aside from the backpack issues we love the iRocker. The iRocker's build and two-year warranty together with a set of high quality accessories makes this a great package. Just make sure you buy a decent backpack to go with it! 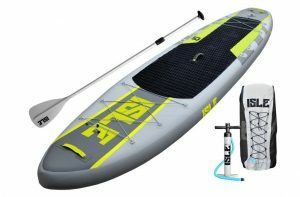 Our 2nd top 3 board – ISLE SUP Explorer. This board has the pedigree and build quality to last you a very long time, its durable military grade PVC skin is resistant to scratches, collisions and the harsh summer sun. All these benefits and all in a remarkably light 19.1 lbs board! ISLE’s warranty includes a no-quibble 30-day money back guarantee if, for any reason, you’re not satisfied with their board. The Explorer is designed for adventure – the board has two large bungee areas attached with ten D-clips for amazing storage flexibility. There are a further four D-clips positioned so you can attach a kayak seat or a cooler. The track pad is a generous two-thirds of the deck which is surprising considering how much space the storage areas take up. The grip material can absorb quite a lot of water; we would advise ensuring it is fully dried out before storing it to avoid mould growth and unpleasant smells. The Explorer has the usual center-mounted carry handle but also two further durable handles fore and aft. The accessories include a three-piece aluminum travel paddle, high pressure pump, repair kit and sturdy branded backpack. On the water the Explorer handles like a dream. The slight rocker deals with moderate swell; the board’s ample width makes it very stable. These both add up to a very comfortable ride. To test out its adventuring chops we removed the third fin and headed off down some class II and III rapids and were excited by how it performed – no drama, just confident tracking. Is there anything that the Explorer doesn’t do well? Not really, the negatives are nothing spectacular. Our most unfit reviewer found it very difficult to inflate the board beyond 11 psi but its fittings would allow you to use a motorized pump if this would be better for you. Our stronger reviewers found it took 180 pumps in around 5 minutes to inflate it fully. At the top end of the market, we have the biggest paddle board. At 14 feet long and a whopping 8 inches in depth the Xplorer is in a class of its own. We were really impressed with its load-bearing figure of 800 lbs, almost twice, that of the competition. Considering the size, the thickness of the military-grade PVC and quality of the build it’s not surprising that this beast weighs 36 lbs. But even at that weight it’s still fairly portable, rolling up neatly like a sleeping bag. But then where do you put it? At this price point we were stunned that this was the only SUP from our test that didn’t come supplied with a backpack. The Xplorer has one detachable fin and this needs a Phillips screwdriver to fix in position. Again, considering the price tag we would have expected a tool-less solution and one less thing to remember or lose. The deck lets us down for having no bungee area – who goes paddleboarding without a dry bag or some kit? There is one D-clip at the nose for towing behind a boat or for mooring but that’s the only one present. The track pad covers around half of the deck which limits how many passengers you can take with you be they adults, children or dogs – which begs the question: why do you make a board so big with so much capacity that it fails to make best use of it? The supplied accessories like the pump are standard and the paddle is heavy. It’s not too difficult to get the board rigid at 10 psi but trying to get it up to 14 psi is problematic. The pump doesn’t like handling the strain of this kind of pressure. We would recommend purchasing a separate paddle if you are going to use this SUP seriously. Remember to take into consideration the extra depth of this board if you decide to buy yourself a good quality paddle. So what about performance? Here we were thrilled with this aspect of the SUP. It is supremely stable, easy to steer and sits high in the water. On calm or slightly choppy days you can travel along without getting your feet wet. It’s surprisingly fast for its size too, helped along by the rocker on the nose. But it’s not all about speed; the board is great for practising spiritual disciplines like yoga. Fishing is a doddle on this secure platform; it’s easy to haul a heavy catch on board. The Peak SUP is one of the most solid-feeling boards we’ve tested. Its military grade PVC construction is very strong and will withstand many scrapes on rocky shores, collisions and shingle beach landings. When fully inflated the board is rigid and almost undistinguishable from that of a solid board. It’s a little heavier than some of the other boards on test at 23 lbs but it’s not overly weighty. 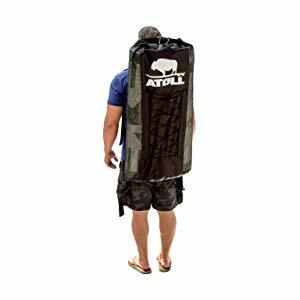 The package includes a coil ankle leash, a repair kit, a three piece adjustable aluminum travel paddle (65” – 86”) and a good quality, branded backpack. The paddle is a little heavier than we are used to but it does float – something you can’t be sure of with adjustable paddles as the water usually seems to find its way in. The dual-action high pressure pump will get you to 15 psi in about 6 minutes with constant inflation, getting you a decent workout in the process. PEAK offers a 30-day risk free returns guarantee which is a welcome bonus, making the idea of purchasing the board less worrisome. 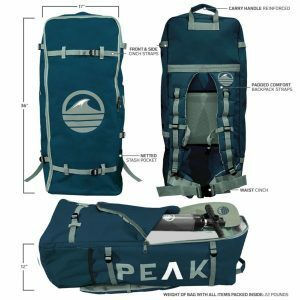 The PEAK has single, removable travel fin which uses a tool-less system. Our reviewer found the mechanism straightforward and was confident that the fin would stay in place during an excursion. At the lower end of the budget the Breeze is a great inflatable SUP for beginners. The first thing we noticed was its amazing color scheme, the green really pops and the seahorse pattern is beautiful. We were impressed by the sturdiness of the skin, it feels durable and the double-wall drop stitch core design is likely to fend off all but the worst bumps and scratches. This budget board doesn’t scrimp on the peripherals either. The Breeze is supplied with a two piece aluminum paddle that floats in water. This is always a good sign as multi-piece paddles tend to allow water in and sink. The removable tri-fin design is a rarity in boards in this price bracket – having all three fins attached gives you the most stability, having no fins gives you the most speed. As with all the boards on test, this comes with its own hand pump. The Breeze package also includes a comprehensive repair kit. The deck provides excellent grip, its EVA pad with honeycomb groove offers comfort and confidence especially important when learning. The small bungee area allows you take some items on board with you. It would be better if more space had been given over to this but it’s a minor niggle. The board has three D-clips – something that’s not always present in higher-end boards. Well-positioned, these can be used to attach a leash and other equipment to. If there is a downside to this board then it’s the relatively small maximum load weight. 209 lbs only caters to the single rider and we’ve found that anyone weighing over 180lbs will experience the board bowing. The faux-military green design with US Air Force-style star design incorporating a buffalo riding a SUP may not appeal to everyone. The Atoll is lighter than we expected, being made of a novel construction dual-layer PVC. The manufacturer states this weight improvement is around 30% when compared with similar boards. The Korean-style drop-stitch is extremely rugged and there’s little chance of it taking much damage. The accessories pack is well-specced. We had a high pressure Bravo dual-action pump that inflates in the push down and pull up stroke. It comes with its own bag too so you can keep it dry and free of sand. There were also front and back bungee tie-downs, a repair kit and a good quality backpack. The backpack matched the board’s styling and has a waist strap to make carrying it more comfortable. The weight of the board is 22 lbs and the whole package comes in at a little less than 27 lbs. The lightweight aluminum panel is a three-piece affair with a nylon blade. The board has two fixed fins and includes a third good quality detachable central fin. There are two donut-shaped foam rings that slide over the fins when in the bag to prevent undue wear and tear on the inside of the bag – they’re a nice touch. On the board, the Atoll has a handsome number of D-rings, 14 in total around the perimeter. On the water it’s everything you would expect, stable, true-tracking and springy if you jump up and down! It’s great in choppy waters too, because of the rocker built into the nose helping it cut through the waves. We loved how maneuverable the Atoll was, it handled as well as most solid boards do. Atoll paddleboards come with a two-year warranty which is always welcome to see. It gives us more confidence to recommend this board knowing that the manufacturer is assured of its quality. Atoll also has a well-deserved reputation for excellent customer satisfaction. 30 day return after test! SBBC SUP is backed by a 2 year guarantee which gave us confidence in what to expect in terms of build quality when we opened the box. As we unpacked it we uncovered a rather attractive-looking board. A silvery wood grain pattern manages to look classy rather than tacky and has to be one of our most favorite designs on test. The accessories package is generous, consisting of a good quality high pressure pump, a waterproof floating repair kit container, a well-laid-out branded black rucksack and a premium 10 ft coiled TPU ankle leash. We only had to inflate this to 11 psi to make the board rigid enough to load it near its maximum weight-bearing capacity – an impressive feat. The specs list this board as being safe to inflate up to 25 psi but there is no reason why you would: we take it as a measure of their confidence in the seams and structural integrity of this military-grade PVC board. The track pad easily covers an amazing three fourths of the deck and offers incredible grip, but does this impinge on storage? Not a bit of it! On-board storage is amply covered by two sizable bungee areas using 10 D-clips. There is also a towing clip at the front, the typical central carrying handle and a further D-clip aft. Not an inch of the available deck space is wasted and we really love that! With a build quality this good and such an eye to detail we have no hesitation in recommending this fabulous SUP. We received a stunning pink and black patterned XTERRA to test – you wouldn’t lose this in a hurry! In the flesh the pink is more subdued but it really makes for an attractive board. It may not appeal to most male paddleboarders but the majority of our male reviewers rather liked the design. The material is a strong military grade drop stitch with double reinforced panels on the top, bottom and sides. XTERRA happily demonstrate the SUP’s resilience by driving a car over it. A 30-day money-back guarantee and a five-year warranty on repairs rounds off their confidence in the product. The bundled backpack is of the roller bag style which is quite unusual but it’s very practical. It’s not a generic backpack either but one with the color-coordinated design from the board. Other accessories include a repair kit, XTERRA-branded paddle and repair kit. The diamond pattern track pad provides amazing grip and we found it equal to any of the best here. There is a small bungee area and a D-clip fore and aft for mooring or towing behind a boat. Additionally these clips can be used to help transport the inflated SUP on a roof rack. The XTERRA has three removable fins which is also a handy feature allowing you to make the best choice for speed and trajectory. The XTERRA is a great all-round package, well-thought-out, durable and offering a lot of flexibility for your personal needs and proficiency. We have no hesitation in recommending this brilliant SUP. 60 day "ride and love it guarantee"
For almost 13 years ISLE have been producing inflatable SUPs and it shows in their build quality and eye on design, mixing practicality and appearance into a great look. The All Around is the first of the three ISLE boards on test. The All Around’s impressive construction makes it weigh in at a tiny 17.5 lbs which we feel makes it an obvious choice for a younger or smaller paddleboarder. The body comprises very robust military grade PVC and ISLE backs up its warranty with a no-quibble money back guarantee if you are not happy within the first 30 days of ownership. So how does ISLE make their boards light and strong? Their guide states that they use a high end manufacturing process “and machine coat the drop stitch with a special seal and bonding layer, and then add another machine-laminated, higher-density PVC layer. This creates a consistent, unique bond by a highly controlled machine process that’s just not achievable via the previous hand-gluing methods of our competitors. The end result is a lighter, stiffer, more durable iSUP board without any of the extra weight”. The included accessories include an aluminum adjustable paddle (weighing 2.6 pounds) which is advertised as floating. From experience we know that adjustable paddles can take on water and sink. We contacted the supplier and they said they would do us a discount on a carbon fiber paddle should we prefer not to take the chance. The All Around comes with a strong carry bag, a detachable third fin and a good quality pump with ergonomic handles. The deck is of the ‘allround’ type, not surprising considering its name. Most of the boards on test are more ‘cruiser’ like, having a pointed nose to create a speed advantage. The All Around is excellent when it comes to stability – two of our reviewers were able to do paddle board yoga with ease. Another advantage of this shape is that it literally has more deck area than any of the others on test for its length. The drawback, of course, is that the All Around is a slower SUP and if speed is an important factor in your choice then look elsewhere. If you are just starting out or if the added stability this shape affords, appeals to you then this could be your ideal board. The board’s bright, lively blue and white design attracted quite a few favorable comments from other paddleboarders. The track pad’s surface provides a lot of grip and its two-tone dark gray and white is made of colored material, not the same material painted up, so you needn’t be worried that the deck pattern will wear off. There are two carry handles on our board – the typical center one and one at the nose. There is a small bungee area which is a shame as there is plenty of open deck space for more storage. There is one D-clip aft but that’s all. Inflating this SUP took five minutes and the supplied pump was more than adequate for the task. We only found the last 1 psi hard to reach. The third travel fin mechanism could do with a little bit of a rethink – it’s a tool-less fitting which is good but it can become time-consuming to insert correctly. On the water the board travelled true and we have no complaints on this front. One of our taller reviewers extended the paddle to nearly its full length and raised a concern that it became very wobbly – this would be a good excuse to replace it with one of better quality. On a more positive note, he did find this board to be one of the easiest to turn using his legs alone. Are there any other matters that may concern potential buyers? Well there are quite a few cases of the All Around being shipped without the advertised accessories like the backpack, and others having additional or missing D-clips. In the world of SUPs, specifications are changing all the time and usually for the better. But it can lead to disappointment and also extra expense if you end up having to purchase additional products to supplement a board that is lacking in what you expect. With this in mind we would suggest that you contact your chosen supplier prior to ordering to ensure you are going to be happy with your purchase. The Saturn is light gray board with a vibrant orange track pad. It’s amazingly light at only 19 lbs and despite its relatively narrow width of 30 inches it remains more stable than you might imagine. In use we found we missed the extra inches of width more for standing space than balance. The skin of the board is strong heavy-duty PVC, more than enough for most uses. The Saturn has extra strips of PVC overlapping critical seams which protects against leaking at 15 psi and gave us confidence in the water. The included accessories are the ubiquitous pump, a carry bag and repair kit but the omission of a paddle is a big disappointment. The pump is of dubious quality, our test board had a cheap-looking hose and fittings too and we wouldn’t expect you to be able to inflate this board many times before the pump gave out. Its innovative positioning of 2 pairs of D-rings is set up for you to attach a kayak seat or low profile beach chair. As an inflatable kayak you get a great upper body workout. The board comes with a single long detachable fin – an unusual feature and it’s important to remember to fix this on before inflating. Trying to attach the fin afterwards is impossible. On the lake where we tested it we found that it tracked well, no doubt thanks to the large fin. Anecdotally we think it was faster than a typical inflatable SUP due to its narrower body. We pumped ours up to 14 psi and felt that it was rigid enough for someone of average build but we would be wary of overloading this board. It bowed noticeably when we approached the maximum limit. The first thing that blew us away with this board was the stunning red and black layout with one of Aqua Marina’s stylish shark designs emblazoned across it. Not to everybody’s taste but we love it! The second was the sheer expanse of the deck track pad – almost two-thirds is given over to a reliable EVA honeycomb grip surface. The bungee area is smaller than most but is part of the pay-off from having such a large track pad. The accessories package includes a decent pump which will get your SUP inflated after about 6 minutes of constant driving. The Monster has a single detachable fin which is of the slide-on type. The housing for it is a good fit and holds the fin tightly. The papoose-style backpack is good quality but it’s personal preference over whether this is the loading-type you are happiest using. On the water the board tracks beautifully in part due to the head-up shape of the nose allowing it to cut through choppy water while remaining stable. Our combined 330 lbs of reviewers were content with its stability and there was no sign of any bowing. With a depth of 6” and it being a large board you may find it tricky to get back on board if you fall off. We would advise adding attachments to the D-clips as hand holds to make it easier to get back on.